A SLAMF7-directed immunostimulatory antibody used to treat multiple myeloma. Elotuzumab (brand name Empliciti, previously known as HuLuc63) is ahumanized monoclonal antibody used in relapsed multiple myeloma. 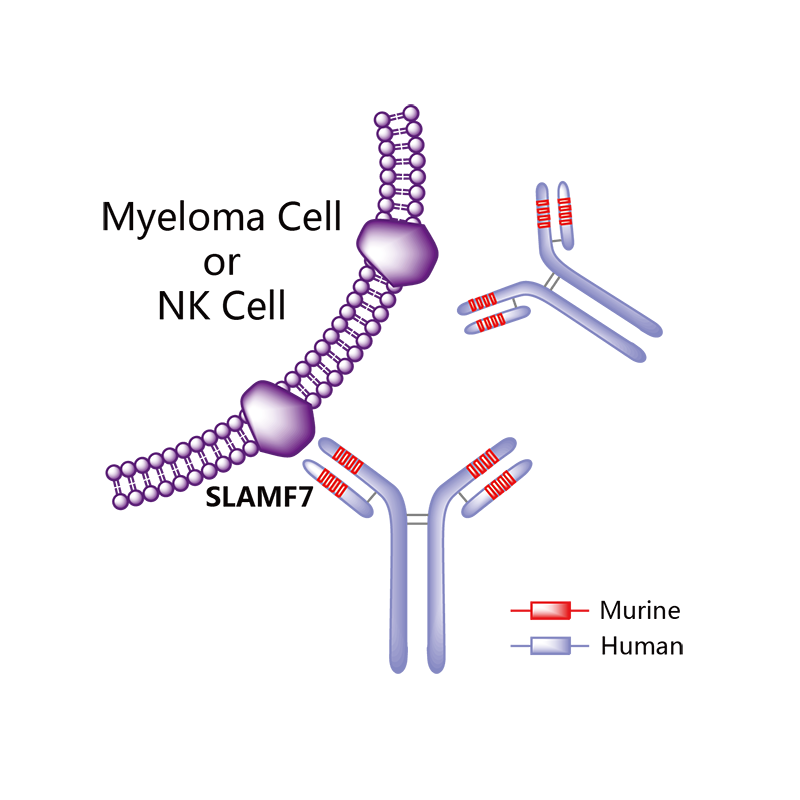 The package insert denotes its mechanism as a SLAMF7-directed (also known as CD 319) immunostimulatory antibody. In May 2014, it was granted “Breakthrough Therapy” designation by the FDA. On November 30, 2015, FDA approved elotuzumab as a treatment for patients with multiple myeloma who have received one to three prior medications. Elotuzumab was labeled for use with lenalidomide anddexamethasone. Each intravenous injection of elotuzumab should be premedicated with dexamethasone, diphenhydramine, ranitidine andacetaminophen. Elotuzumab is APPROVED for safety and efficacy in combination with lenalidomide and dexamethasone. 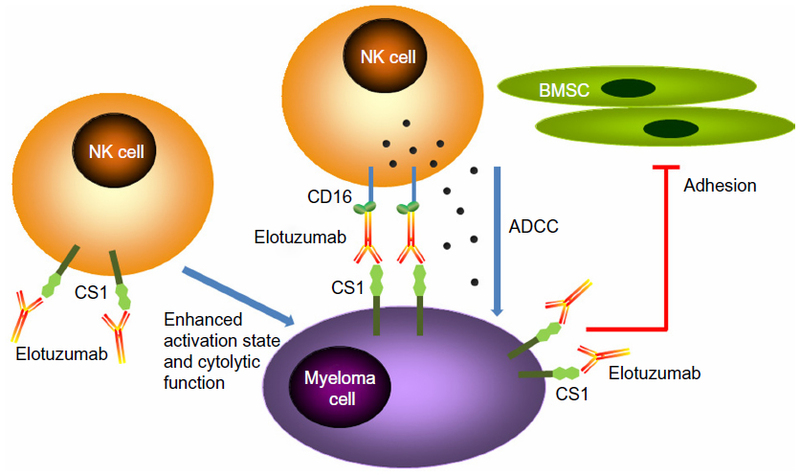 Monoclonal antibody therapy for multiple myeloma, a malignancy of plasma cells, was not very clinically efficacious until the development of cell surface glycoprotein CS1 targeting humanized immunoglobulin G1 monoclonal antibody – Elotuzumab. Elotuzumab is currently APPROVED in relapsed multiple myeloma. Elotuzumab (HuLuc63) binds to CS1 antigens, highly expressed by multiple myeloma cells but minimally present on normal cells. The binding of elotuzumab to CS1 triggers antibody dependent cellular cytotoxicity in tumor cells expressing CS1. CS1 is a cell surface glycoprotein that belongs to the CD2 subset of immunoglobulin superfamily (IgSF). Preclinical studies showed that elotuzumab initiates cell lysis at high rates. The action of elotuzumab was found to be enhanced when multiple myeloma cells were pretreated with sub-therapeutic doses of lenalidomide and bortezomib. The impressive preclinical findings prompted investigation and analysis of elotuzumab in phase I and phase II studies in combination with lenalidomide and bortezomib. In phase I trial of elotuzumab in combination with Velcade/bortezomib in patients with relapsed/refractory myeloma, the overall response rate was 48% and activity was observed in patients whose disease had stopped responding to Velcade previously. 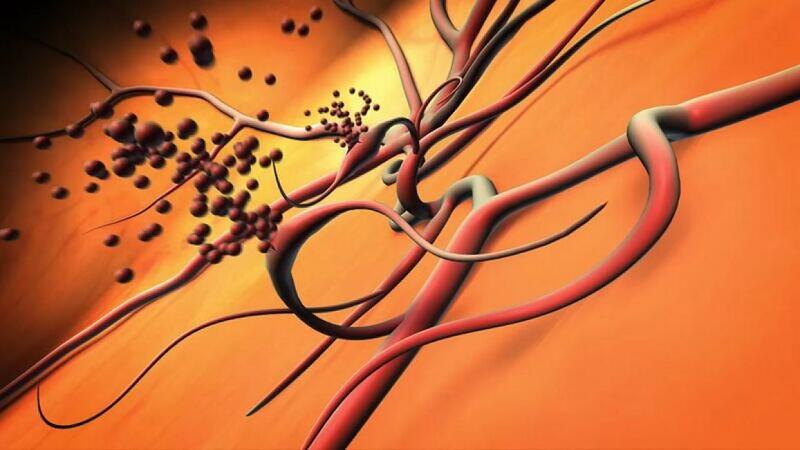 The trial results found that elotuzumab enhanced Velcade activity. A phase I/II trial in combination with lenalidomide and dexamethasone in refractory/relapsed multiple myeloma patients showed that 82% of patients responded to treatment with a partial response or better and 12% of patients showed complete response. Patients who had received only one prior therapy showed 91% response rate with elotuzumab in combination with lenalidomide and dexamethasone. Phase I/II trials of the antibody drug has been very impressive and the drug is currently into Phase III trials. Two phase III trials are investigating whether addition of elotuzumab with Revlimid and low dose dexamethasone would increase the time to disease progression. Another phase III trial (ELOQUENT 2) is investigating and comparing safety and efficacy of lenalidomide plus low dose dexamethasone with or without 10mg/kg of elotuzumab in patients with relapsed/refractory multiple myeloma. Elotuzumab is being investigated in many other trials too. It is being evaluated in combination with Revlimid and low-dose dexamethasone in multiple myeloma patients with various levels of kidney functions, while another phase II study is investigating elotuzumab’s efficacy in patients with high-risk smoldering myeloma. The main target of multiple myeloma drug development is to satisfy the unmet need for drugs that would improve survival rates. Elotuzumab is an example that mandates much interest in this area and should be followed with diligence. 1 “Press Announcement—FDA approves Empliciti, a new immune-stimulating therapy to treat multiple myeloma”. U.S. Food and Drug Administration. Retrieved 3 December 2015. 2“Empliciti (elotuzumab) for Injection, for Intravenous Use. Full Prescribing Information” (PDF). Empliciti (elotuzumab) for US Healthcare Professionals. Bristol-Myers Squibb Company, Princeton, NJ 08543 USA. 3 “Bristol-Myers Squibb and AbbVie Receive U.S. FDA Breakthrough Therapy Designation for Elotuzumab, an Investigational Humanized Monoclonal Antibody for Multiple Myeloma” (Press release). Princeton, NJ & North Chicago, IL: Bristol-Myers Squibb. 2014-05-19. Retrieved 2015-02-05. NIH-funded clinical trial marks first major advance in therapy in 40 years. Abnormal blood vessels bleeding into the center of the eye due to proliferative diabetic retinopathy. “Lucentis should be considered a viable treatment option for people with proliferative diabetic retinopathy, especially for individuals needing anti-vascular endothelial growth factor for diabetic macular edema,” said Jeffrey G. Gross, M.D., of the Carolina Retina Center in Columbia, South Carolina, who chaired the study. Dr. Gross presented results November 13, 2015, at the annual meeting of the American Academy of Ophthalmology in Las Vegas. The study is registered as NCT01489189 at ClinicalTrials.gov(link is external). View an NEI video about the study at https://youtu.be/jPoCIa0_1po(link is external). (HealthNewsDigest.com) – Agglutinated proteins in the brain, known as amyloid-β plaques, are a key characteristic of Alzheimer’s. One treatment option uses special antibodies to break down these plaques. This approach yielded good results in the animal model, but for reasons that are not yet clear, it has so far been unsuccessful in patient studies. Scientists at the Technical University of Munich (TUM) have now discovered one possible cause: they noticed that, in mice that received one antibody treatment, nerve cell disorders did not improve and were even exacerbated. Some antibodies designed to eliminate the plaques prominent in Alzheimer’s disease can aggravate neuronal hyperactivity in mice. Removing built-up plaques of amyloid-β in the brain is a long-sought therapy for patients with Alzheimer’s disease, but for a variety of reasons, few treatments have succeeded in alleviating symptoms once they reach clinical trials. In a study published today (November 9) in Nature Neuroscience, an international team examined the effects of two amyloid-β antibodies on neuronal activity in a mouse model, finding that the antibodies in fact led to an increase in neuronal dysfunction. Among the most promising approaches for treating Alzheimer´s disease is immunotherapy with amyloid-β (Aβ)-targeting antibodies. Using in vivo two-photon imaging in mouse models, we found that two different antibodies to Aβ used for treatment were ineffective at repairing neuronal dysfunction and caused an increase in cortical hyperactivity. This unexpected finding provides a possible cellular explanation for the lack of cognitive improvement by immunotherapy in human studies. The team’s latest experimenters used mice with a genetic mutation that caused them to overexpress the human amyloid-β protein; these engineered mice also displayed neuronal hyperactivity. The researchers injected 3D6, the mouse version of bapineuzumab, into the engineered mice, as well as into wild-type mice that had normal expression levels of the mouse amyloid-β protein. The team observed the effects using two-photon calcium imaging in a blinded study. As expected, 3D6 decreased the amount of amyloid-β plaques in the engineered mice, while the control mice displayed no reaction to the injected antibodies. However, the mice engineered to overexpress human amyloid-β showed increased neuronal hyperactivity in response to the antibody, regardless of what stage of plaque development they were in. Even mice too young to have developed plaques showed aggravated hyperactive neurons. The team observed the same phenomenon when it tested a second antibody, β1, which went through early stages of drug development but was never used in human clinical trials. M.A. Busche et al., “Decreased amyloid-β and increased neuronal hyperactivity by immunotherapy in Alzheimer’s models,” Nature Neuroscience, doi:10.1038/nn.4163, 2015. Figure 1: Anti-Aβ antibody 3D6 reduces amyloid pathology but aggravates neuronal dysfunction. Figure 2: Worsening of neuronal dysfunction by anti-Aβ antibodies can occur independently of the effects on Aβ pathology. Therapies that reduce deposits of amyloid-β (Aβ) in the brain are ineffective at repairing neuronal impairment in mice and actually increase it, finds a study published online in Nature Neuroscience. Aβ deposits aggregate into clumps in the brain which are a pathological hallmark of Alzheimer’s disease. Arthur Konnerth, Marc Busche and colleagues explored whether they could reverse these impairments by treating mice that overexpress the human mutant amyloid precursor protein with either of two different antibodies targeting Aβ (14 mice) or a control antibody (19 mice). They found that, although treatment with the Aβ targeting antibodies reduced the amount of plaques in the animals’ brains, it also increased the amount of hyperactive neurons. The authors note that, although other research has shown that anti-Aβ treatment can prevent the weakening of neuronal connections and memory impairments in animal models of Alzheimer’s disease, these benefits are not enough to repair neuronal dysfunction. ANAVEX™ 2-73 is an orally available drug candidate developed to potentially modify Alzheimer’s disease rather than temporarily address its symptoms. It has a clean Phase 1 data profile and shows reversal of memory loss (anti-amnesic properties) and neuroprotection in several models of Alzheimer’s disease. A Phase 1 single ascending dose human clinical trial of ANAVEX 2-73 was successfully completed in healthy human volunteers. It was a randomized, placebo-controlled study. Healthy male volunteers aged 18 to 55 received single, ascending oral doses over the course of the trial. The trial objectives were to define the maximum tolerated dose, assess pharmacokinetics (PK), clinical and lab safety. Maximum tolerated dose 55-60 mg; above the equivalent dose shown to have positive effects in mouse models of Alzheimer’s disease. Well tolerated below the 55-60 mg dose with only mild adverse events in some volunteers. Observed adverse events at doses above the maximum tolerated single dose included headache and dizziness, which were moderate in severity and reversible. These side effects are often seen with drugs that target central nervous system (CNS) conditions, including Alzheimer’s disease. No significant changes in blood safety measurements. The trial was conducted in Germany by ABX-CRO in collaboration with the Technical University of Dresden. ABX-CRO and the Technical University of Dresden are well regarded for their experience with clinical trials and CNS compounds. Clinical-stage biopharmaceutical company Anavex Life Sciences Corp. is working on an investigational oral treatment for Alzheimer’s disease called ANAVEX 2-73, with full PART A data and preliminary PART B data from its ongoing Phase 2a clinical trial to be presented during the Clinical Trials on Alzheimer’s Disease (CTAD) conference, November 5 and 7 in Barcelona, Spain. The trial’s Principal Investigator, Stephen Macfarlane, who also serves as director and associate professor at Aged Psychiatry, Caulfield Hospital in Melbourne, Australia, will represent the company and host a late-breaking oral session entitled “New Exploratory Alzheimer’s Drug ANAVEX 2-73: Assessment of Safety and Cognitive Performance in a Phase 2a Study in mild-to-moderate Alzheimer’s Patients.” During the presentation, which will take place Saturday, November 7, at 9:45 a.m. CET, at the Gran Hotel Princesa Sofia, in Barcelona, Macfarlane will focus on the the multicenter Phase 2a clinical trial of ANAVEX 2-73. The study includes two separate phases and includes 32 mild-to-moderate Alzheimer’s patients. While PART A is a simple randomized, open-label, two-period, cross-over, adaptive trial of up to 36 days, PART B is an open-label extension trial for an additional 52 weeks. The research intends to assess the maximum dose of treatment tolerated by patients, and to explore cognitive efficacy using mini-mental state examination score (MMSE), dose response, bioavailability, Cogstate and electroencephalographic (EEG) activity, including event-related potentials (EEG/ERP), as well as the preformance of ANAVEX 2-73 as an add-on therapy to donepezil (Aricept). ANAVEX 2-73 is Anavex’s lead investigational treatment for Alzheimer’s disease, in line with the company’s goal of finding effective therapies for Alzheimer’s disease, other central nervous system (CNS) diseases, pain, and various types of cancer. The novel drug targets sigma-1 and muscarinic receptors, which are thought to decrease the amount of protein misfolding, beta amyloid tau and inflammation through upstream actions. Last November, the biopharmaceutical company presented encouraging results from their phase 1 clinical trial for Anavex 2-73, during the CNS Summit 2014 in Boca Raton, Florida. The phase 1 study demonstrated that the treatment is safe and well tolerated, suggesting a favorable pharmacokinetics profile. During the randomized, double-blind, placebo-controlled study no severe adverse events were registered, while the adverse events reported included moderate and reversible headache and dizziness, which are common symptoms associated with drugs that target central nervous system (CNS) conditions, such as Alzheimer’s. Background: Despite major efforts aimed at finding a treatment for Alzheimer’s disease (AD), progress in developing compounds that can relieve cognitive deficits associated with the disease has been slow. ANAVEX 2-73 is a sigma-1 and muscarinic receptor agonist that in preclinical studies has shown memory-preserving and neuroprotective effects. In our ongoing phase 2a clinical study we are assessing ANAVEX 2-73 safety in subjects with mild-to-moderated AD, and measuring drug effects on MMSE, EEG and Event Related Potentials (ERP) cognitive measures, and Cogstate test batteries to optimize dosing. Methods: Thirty-two subjects that meet NINCDS-ADRDA criteria for probable AD are being recruited at up to seven clinical sites in Melbourne, Australia. Subjects are between 55 and 85 years of age, and have an MMSE of 16 to 28. In PART A of the study, participants are administered ANAVEX 2-73 orally and IV in an open-label, 2-period, cross-over trial with adaptive study design lasting up to 36 days for each participant. In PART B of the study, all participants are administered ANAVEX 2-73 daily orally. MMSE, EEG/ERP (P300) and Cogstate tests are performed at baseline and subsequently at weeks 12, 26, 38 and 52 of the PART B open label extension. Results: The primary outcome of the study is safety, and ANAVEX 2-73 was well tolerated. In the secondary outcome endpoints preliminary analysis of data from subjects shows an average improvement of the MMSE score at week 5. A majority of all patients tested so far improved their respective MMSE score. The average EEG/ERP (P300 amplitude) signal also improved and also the average Cogstate test improved across the test batteries. Conclusions: Data collected so far indicate that ANAVEX 2-73 is safe and well tolerated. Interim results also show improved cognitive performance after drug administration in subjects with mild-to-moderate AD. The current results seem to justify a prospective comparison with current standard of care in a larger clinical trial study. A more complete set of results will be available at the time of the conference. In 2014, the American Academy of Pediatrics (AAP) updated their recommendations for palivizumab prophylaxis for children who are at high risk for severe respiratory syncytial virus (RSV) infection. To investigate the potential impact of the more restrictive 2014 criteria on the eligibility for palivizumab prophylaxis, we applied the 2012 and 2014 AAP recommendations for palivizumab prophylaxis to a multicenter cohort of 2207 US children hospitalized for bronchiolitis. According to the 2012 AAP recommendations, 215 children (9.7%) were eligible for palivizumab prophylaxis, while 140 children (6.3%) would have been eligible based on the 2014 updated recommendations (34.9% relative decrease; 95% CI: 28.5–41.7%). The decrease was largely driven by the restriction of eligibility to preterm infants with gestational age < 29weeks. Further development of and reﬁnement of cost-effective approaches for the prevention of severe RSV infection are needed. In 2014, the American Academy of Pediatrics (AAP) updated and replaced their recommendations for palivizumab prophylaxis from 2012.4 The updated guidelines support a more restrictive use of palivizumab:3 for example, they recommend against the use in infants born ≥ 29 weeks’ gestation who have no additional risk factors for severe RSV disease. Despite these substantial changes to the guideline recommendations, there are no publications that assess the potential impact on the eligibility for palivizumab prophylaxis in US children. To address the knowledge gap in the literature, we investigate the potential impact of the more restrictive 2014 criteria on the eligibility for palivizumab prophylaxis in a well-characterized national cohort of children hospitalized for bronchiolitis. Over the 3year study period, we enrolled 2207 children hospitalized for bronchiolitis to one of the 16 sites. Demographic characteristics, medical history, and clinical course are summarized in Table 1. Overall, the median age was 4months (IQR, 2–9 months) and 1311 (59.4%) were male. Additionally, 285 children (12.9%) were born at gestational age <35 weeks; 460 (20.8%) had one or more major comorbid medical disorders. According to the 2012 AAP recommendations, 215 children (9.7%) were eligible for palivizumab prophylaxis (Table 2), while 140 children (6.3%) would have been eligible based on the 2014 updated recommendations. Applying the more restrictive 2014 criteria would have led to 75 fewer children (34.9% relative decrease; 95%CI: 28.5–41.7%) being eligible for palivizumab prophylaxis. The most frequent reason for the loss of eligibility was the 2014 criterion for prematurity that restricts eligibility to infantswithgestationalage<29weeks;thischangeledto45fewer children being eligible (40.9% relative decrease; 95%CI: 31.6–50.7%). The next most frequent reason was the 2014 criteria that limit eligibility to infants with chronic lung disease or congenital heart disease in the ﬁrst year of life;this change led to 22 fewer children being eligible for palivizumab prophylaxis (22.9%relative decrease; 95%CI: 15.0–32.6%). Among the 2207 children in the cohort, 207 children (9.4%) had received palivizumab prophylaxis prior to the index hospitalization. Among 215 children eligible for prophylaxis based on the 2012 recommendations, 117 (54.4%) had received palivizumab prophylaxis. Among 140 children eligible for prophylaxis based on the 2014 recommendations, 72 (51.4%) had received palivizumab prophylaxis (Table 1). In this analysis of a large multicenter cohort of children hospitalized for bronchiolitis, we found that approximately 10% of children were eligible for palivizumab prophylaxis based on the 2012 AAP recommendations. When applying the more restrictive criteria of the 2014 updated recommendations, one-third of these children would have become ineligible for palivizumab prophylaxis. To thebestofourknowledge,thisisthe ﬁrststudytoreportthepotential impact of the change in the AAP recommendations on the eligibility for palivizumab prophylaxis in young children, a ﬁnding of public health and research importance. In 1998, palivizumab was licensed by the US Food and Drug Administration (FDA) for prevention of severe RSV diseases in children at high risk, but the FDA did not issue more speciﬁc recommendations, nor deﬁne high risk.This absence of a speciﬁc definition has led several groups to attempt to identify children at high risk who would be eligible for palivizumab prophylaxis.3,6 The AAP published the ﬁrst policy statement on the use of palivizumab in 1998.7 On the basis of the availability of additional data, the AAP has updated the guidelines in 2003, 2006, 2009, 2012,4 and 2014.3 Since the last update of the AAP recommendations, some studies have reported a high cost but limited beneﬁt from palivizumab prophylaxis.8 In this context, the 2014 AAP guidelines recommended a more restrictive use.3 In particular, preterm infants with gestational age ≥29 weeks without additional risk factors became ineligible for palivizumab. In parallel with this change in recommendations, within the present high risk population, the most frequent reason for the loss of eligibility was the use of the restrictive criterion for prematurity: that is, preterm infants born from 29t o35 weeks’ gestation with no additional risk factors became ineligible. This speciﬁc group of preterm infants accounts fo ra large number of births in the US:approximately 10% of US births in 2012.9 Thus, one may argue that the use of this restrictive criterion would result in an increase in the number of preventable severe RSV infections,10 even considering the potentially limited efﬁcacy of palivizumab in this population. As described in the technical report of the 2014 AAP recommendations, however, it is challenging to deﬁne an optimal threshold of gestational age in preterm infants for which palivizumab prophylaxis may be indicated. The present observations should facilitate further investigations that seek high-quality and cost-effective preventive strategies for a large number of vulnerable children. This study has several potential limitations. First, the analysis was not designed to examine the efﬁcacy or effectiveness of palivizumabprophylaxis. Rather, we sought to examinethe potential impact of the updated recommendations on the eligibility for palivizumab in a well-characterized national cohort of children hospitalized for bronchiolitis. Second, the present study investigated only children hospitalized for bronchiolitis; thus, those with other types of severe respiratory infection (e.g. pneumonia) were not examined. Inclusion of these populations may yield different inferences. Nevertheless, the present ﬁndings are directly relevant to >120 000 US children hospitalized for bronchiolitis (and their families) each year.1 Finally, the study participants were those who were hospitalized in academic centers. Therefore, the present inferences may not be generalizable to the US population as a whole. Children hospitalized at academic centers, however, have disproportionately high morbidity; it is in precisely this population for which targeted preventive measures are needed. In conclusion, we found that 10% of children hospitalized for bronchiolitis were eligible for palivizumab prophylaxis based on the 2012 AAP recommendations. When we applied the more restrictive 2014criteria,one-third of these children were ineligible. The decrease was largely driven by the restriction of eligibility to preterminfantswithgestationalage <29weeks.Forpolicymakers and researchers, because bronchiolitis continues to be a substantial societal burden in an already-stressed health-care system,1 the present ﬁndings support further development and reﬁnement of cost effective approaches for the prevention of severe RSV infection. 1 Hasegawa K,Tsugawa Y,Brown DF,Mansbach JM,Camargo CA Jr. Trends in bronchiolitis hospitalizations in the United States, 2000–2009. Pediatrics 2013; 132: 28 –36. 2 Hasegawa K, Mansbach JM,Camargo CAJr.Infectious pathogens and bronchiolitis outcomes. Expert Rev. Anti Infect. Ther. 2014; 12: 817 –28. 3 American Academy of Pediatrics Committee on Infectious Diseases and Bronchiolitis Guidelines Committee. Policy statement. Updated guidance for palivizumab prophylaxis among infants and young children at increased risk of hospitalization for respiratory syncytial virus infection. Pediatrics 2014; 134: 415 –20. 4 American Academy of Pediatrics. Respiratory syncytial virus. In: Pickering LK, Baker CJ, Kimberlin DW, Long SS (eds). Red Book: 2012. Report of the Committee on Infectious Diseases. American Academy of Pediatrics, Elk Grove Village, IL, 2012; 609–18. 5 Hasegawa K, Jartti T, Mansbach JM etal.Respiratory syncytial virus genomic load and disease severity among children hospitalized with bronchiolitis: Multicenter cohort studies in the United States and Finland. J. Infect. Dis. 2015; 211: 1550 –9. 6 NHS Commissioning Board. Clinical Commissioning Policy: Palivizumab to reduce the risk of RSV in high risk infants. 2012. Accessed 13 May 2015. Available from URL: http://www.england.nhs.uk/. ediatrics Committee on Infectious Diseases and Committee of Fetus and Newborn. Prevention of respiratory syncytial virus infections: Indications for the use of palivizumab and update on the use of RSV-IGIV. Pediatrics 1998; 102: 1211 –6. 8 Andabaka T, Nickerson JW, Rojas-Reyes MX, Rueda JD, Bacic Vrca V, Barsic B. Monoclonal antibody for reducing the risk of respiratory syncytial virus infection in children. Cochrane Database Syst. Rev. 2013; 4 CD 006602. 9 American Academy of Pediatrics Committee on Infectious Diseases and Bronchiolitis Guidelines Committee. Technical report. Updated guidance for palivizumab prophylaxis among infants and young children at increased risk of hospitalization for respiratory syncytial virus infection. Pediatrics 2014; 134 (2): e620–38.